XML support was first added to Flash 5, it was not supported on Flash 4. This tutorial explains how a Flash movie can retrieve (load and access) data from an external XML file using Action Script 3. If you are used to the complicated way of parsing XML in Action Script 2, you will be delighted with how much easier it is to do the same things in Action Script 3. Why would there be a need to read from a file? Suppose you have a movie that displays a “news of the day.” You could put the content of the news on the swf file, but if you do so, every time the news changes, you’ll need to edit the Flash file. That’s very impractical. So the benefits are: 1) To save time (avoid editing and recompiling of the Flash file); and 2) to separate your application from the data (encapsulation, implementation hiding). You can use regular text file to pass external data – see here. Yet another way to pass external date is to embed the data using the query string or using FlashVars. Basic E4X (for references, see here: http://en.wikipedia.org/wiki/ECMAScript_for_XML). This tutorial is written in Flash CS3. The sample project can be downloaded at the end of the tutorial. 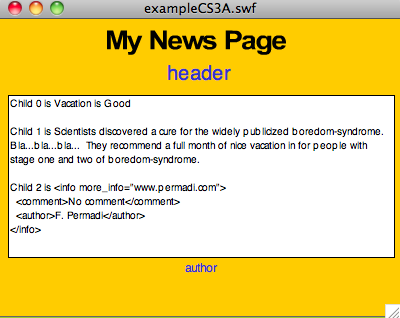 For this tutorial, we are creating a sample XML file that holds “news of the day” mocks. It is not necessarily the best way to represent a news item, but it will do for illustration purpose. 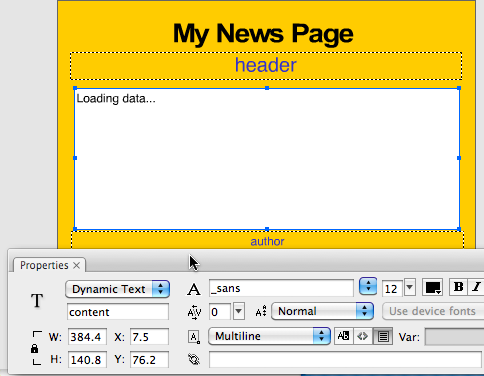 The XML file to be used in this tutorial is called “news.xml” It can be downloaded here: news.xml. The structure of the XML file is shown below. Note that we’re not using a DTD because Flash will ignore it anyway. the root node of the XML file is <news>. A <news> node contains a <header>, a <content>, and an <info> element. An <info> node itself has a “more_info” attribute, and contains a <comment>node and an <author> node. The “header” textbox is named “header” and this box will hold the node. Just for illustration purpose, I name all the text-boxes the same as the XML nodes. PS: Make sure that this button is off so that user can’t select (highlight) the text. It will look weird if you allow user to select the text. The center text-box is named “content“. The “author” textbox is associated with Var: author. This box will hold the name of the node. We’ll ignore the other XML elements such as and for now. Below is the code that loads the XML object. You can add this code to the Frame 1 of the FLA main timeline. We are using the URLLoader class to load the file. 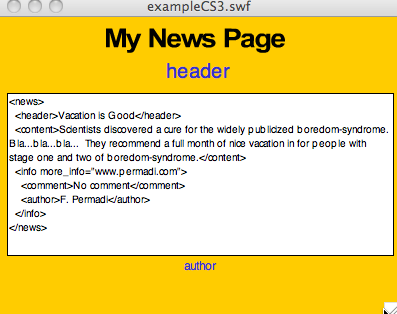 The parameter “news.xml” is the filename to load. Note that the file can be on a different folder or a different server (if the file is on a different server, the other server must have a cross-domain policy that permits you to load the file. Read more about cross-domain policy on the Macromedia site. It is worth noting that when you load external file like this, you should not assume that the file is loaded immediately. Because Flash does not know how large the file is, it runs the process in the background while the movie continues to run. However, Flash is thoughtful enough to notify us when the file has completely loaded by sending an event. In the URLLoader the event is Event.COMPLETE. In the example above, we associate the function named onXMLFileLoaded with that event. Below is the code with onXMLFileLoaded added. // the XML data is ready to use, do something with it. we simply assign the data loaded (which is in event.target.data) into an XML object named myXML. Now we can start accessing the data on the XML. You should be seeing the xml content printed on the textbox. It’s not nicely formatted yet, but it’s a start. node should have 3 child nodes (header, content, and info). Let’s extend the tree view and see. A node can only have one parent, but a parent can have multiple children. In the example above, parentNode has 3 child nodes. </parentNode>To access nodes, we can refer to them by the node names or by using the member functions of the XML class. A complete reference of the XML class can be found here: http://livedocs.adobe.com/flash/9.0/ActionScriptLangRefV3/XML.htmlLet’s focus on some of the important functions. Some of the functions returns an XMLList object, which is basically a collection of XML objects. The order is always the same as in the XML file. So, children() is for <header>, children() is for <content>, and children() is for <info>. You can see how easy it is using E4X, assuming you already know what to expect in the XML.